Dear Students, we are all cognizant of the fact that current affairs play a significant role in the General Awareness Section of various banking as well as other banking examinations. So much is happening every day that unless you keep yourself abreast of these changes you cannot adjust yourself to them or tackle the GA section of any exam smoothly and easily. So, to pave your way to ace the grades in General Awareness Section of banking and other competitive exams, Adda247 Publications brings to you The Hindu Newspaper Based One-Liners eBook: January 2019 Edition. The book will be available at a price of Rs. 49 in English Medium. It is necessary to have a basic knowledge of history and geography or political and economic theories. Unless one knows the historical background or the geographical location of events reported, they will convey little of the value of importance. In short, one must bring to the knowledge of current affairs an educated mind, an informed judgment, and an essentially critical understanding, if they are to serve any purpose. So, The Hindu Newspaper Based One-Liners eBook: January 2019 Edition provides day-wise questions on Current happenings, Static and Banking Awareness. Based on the everyday news, questions in the e-book will be updated every evening on a regular basis. 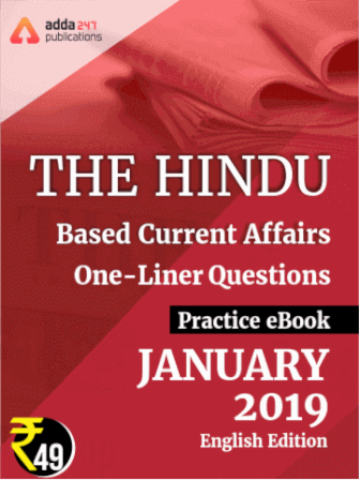 The book will be incorporating more than 300 questions based on the current affairs of 1st Jan to 31st of Jan 2019 from The Hindu newspaper and are prepared by Gopal Anand Sir. Get The Hindu Newspaper Based One-Liners eBook: January 2019 Edition Now! !